One thing that many believers do concerning the handling of Greek words, is use Strong’s Concordance’s Dictionary to translate Greek words – this is not only a fundamental error but can lead to devastating conclusions regarding the misunderstanding of many Greek words. This is because Strong’s dictionary is not specific to any particular word within any particular passage, it is generic based only upon Greek roots, and cannot be used in word studies of any Greek words found in the Greek New Testament. It is in understanding that the Koiné (“common“) Greek language uses many cognates (see Footnote #1) which in spite of utilizing the same root words, derive diverse meanings based upon the grammar; especially verbs concerning their tense, voice, and mood, which is very misleading in understanding the full meanings of Greek words listed in the Strong’s dictionary. All languages combine words (compounds), and have cognates wherein words express diverse meaning, wherein the Greek language abounds in this practice. This is what makes the effort to record a concordance of every book in the Bible so difficult. As stated in the preface to Strong’s concordance and dictionary, his dictionary is a root dictionary wherein many words are not actually spelled as listed in their real meaning when you look them up in a Greek New Testament. The uses of the word “root“ should make the point obvious that this Greek dictionary was never meant to be a specific dictionary concerning precise words and their exact meaning, which is determined within the passage wherein the parsing of the exact word and is noted because of the diverse spelling concerning the use of an affix (Circumfix, Duplifix, Infix, Interfix, Transfix, Simulfix, Suprafix, Disfix) like a prefix (also called a “preformative”) and suffix, which is NOT used in a root dictionary and AND therefore the grammatical breakdown of the verbs into their delineation, as well as the case forms, of which there are five; nominative, vocative, accusative, genitive, or dative; are absent. If a concordance was assembled, which listed all the variances of all the words to their exact meaning within just the Greek New Testament, it would be hundreds of thousands of pages long because of the diversity of words from their original root meaning to the specific meaning of that word with in a specific passage. Therefore, a manageable concordance could ONLY be based upon the root words, but as James Strong says himself in his preface, his dictionary was never meant for Word study. A Word Study by its very nature must break down passages according to their delineation which is specific to that passage alone, meaning that a concordance would have to list many individual passages, since a majority of words are changed in their spelling from one passage to the next. The deviations may be slight in some cases, but the ramifications can be enormous in others. Because of the diversity of combining words (compounds consists of more than one stem, a stem is a part of a word.) and the slightly different spellings wherein there may be over a half a dozen different Greek words, such as the word “judge,” which is translated into only one English word, but has a range of meaning from judging unto condemnation, which is condemned in the Bible and only allowed for the creator God to do, as compared to discernment like when Paul chides the Corinthians for not being able to exercise proper biblical judgment. How often do we hear Christians misquote Scriptures concerning judging, advising others to NOT judge them, even as they openly sin, which is the opposite that is taught in God’s Word? For example, the first chapter of Romans is inaccurately used to tell Christians not to judge, when the immediate biblical context is speaking about unbelievers judging others, not believers. There are more warnings to exercise proper biblical judgment by far than warnings not to judge. In many passages the subject cautions against judging regarding the manner or mindset of judging, or the spiritual state of the individual making the observation. We are NOT told to NOT point out a “speck in our brother’s eye,” but to make sure that we deal with the beam in our own eye first. Discernment is a requirement for human existence, but even more so for a born-again believer. It’s not merely knowing the difference between good and evil, it is also avoiding the rationalization that moves us from good to evil via shades of grey. Many times the enemy of the good is not evil, but second best, when it takes pre-eminence over what is best. Yet, because we have ONLY one English word for “judge,” as compared to the half a dozen in the Greek New Testament, the word “judgement” as used in the English translations is misused and misunderstood; and now we have a whole generation of believers that misunderstand God’s command for us to discern the world around us to the extent that now believers live milquetoast lives because of their inability to exercise godly judgment as seen in Hebrews 5:11-14, where the writer of the book of Hebrews connects the fact that believers cannot indulge in the meat of the word of God because they refused to exercise proper biblical judgment over good and evil, and therefore can only stand the milk of the word. This great misunderstanding has created more false doctrine in churches because we have used root dictionaries to define words within a passage, which do not give us the exact meaning of God’s will concerning that word as seen in Greek or Hebrew word studies. I cannot tell you of how many times I have heard ministers using definitions of Greek words from Strong’s dictionary, and doing so incorrectly as opposed to actually doing the hard work of parsing the Greek and learning how to do so correctly. Strong’s is never meant to be preached from. It is meant to locate passages in the Bible if you know only one word in that passage, but even many of the current hybrid Strong’s Greek dictionaries still display the same problem with presenting only root words. Ministers should be using only Greek New Testaments, or excellent Word Studies that go into great depth, and even Vines doesn’t hold up to this standard. Strong’s contribution, which utilized over a 100 contributors is a fantastic tool in locating passages, especially understanding when it was created over 100 years ago before the use of computers. And the dictionaries in the back are only meant to be a general guide, which he notes in the preface, that no one ever reads; explaining that it is a root dictionary. Though James Strong was a professor, he was NOT a professor in Greek or Hebrew, and was not fluent in these languages, he received nothing but a summary introduction education in these languages. And his credentials as a Doctorate of theology are only honorary; even though he became a professor of Biblical Literature and Exegetical Theology at Troy University and Drew theological seminary in New York. It appears that his highest earned degree was a Masters (Not in biblical languages, but generic in theology), wherein he was the valedictorian of his graduating class. He was given (Not earned) three honors doctorates (Dr. of Divinity, Dr. of sacred theology, and Dr. of laws) degrees (not based upon academia, studies; meaning they were NOT earned), because of his reputation as a professor and his writings; none concerning biblical language. There are a lot of ministers that place Dr. before their name when they have been given Doctor of Divinity (D.D.) degrees, not earned degrees; meaning they are fake! Doctor of Divinity (D.D.) degrees in England are earned degrees, which is an advanced doctorate degree rarely given. In America, this is an honorary degree given usually by a religious organization or institution, but is not an earned degree. Individuals who put Dr. in front of their name are committing a fraud in that people will believe that they earned a doctorate degree, when they have not, it was merely GIVEN to them. When a church, denomination, or religious organization makes a minister a Bishop they will commonly give them a Doctorate of Divinity (This is starting to be seen in many churches, where they love to address their pastor as doctor… . Where many honorary degrees abound, as well as the use of the term “Bishop,” used for pastors; all done as opposed to Matthew 23:1-12.) in recognition of their position, but never earned. How we love titles. No record exists that James Strong majored in biblical languages, or received a degree in this specialized training concerning linguistics for either Hebrew or Greek. Yet now that I understand the Greek, I understand the difference between the English phrasing of this word in the Greek. In the Greek it means to come to understand what has been done, it would be synonymous to a teacher working out the formula of a math problem, doing the work himself, then telling the child to work out how he did it, and how he came to his conclusion on their own. The purpose would be to understand the price that was paid for the conclusion. This is why the passage states that concerning our salvation we should do so with “fear and trembling.” Understanding that to purchase our salvation it cost the most expensive fee in all of existence, the blood of a sinless peer being, the blood of God’s Son, God Himself Jesus Christ to pay the price for our sins. We did nothing whatsoever to deserve salvation, we are not even saved by faith. We are saved by grace, yet faith is a necessary vehicle to access that grace, if you don’t receive it it’s because you don’t believe it, yet faith is not a condition of receiving, it is the method of receiving. Salvation is based solely on the work of Jesus Christ on the cross 2000 years ago, it is this that Paul tells us to work out and understand so that we comprehend the seriousness of sin. Sin is so devastating that the only thing that could balance the scales is complete righteousness, the complete righteousness of Jesus Christ taking our place in pain for our sins, this always brings me to a place of fear in understanding the devastation of sin and a complete and utter respect of how far God was willing to go to pay for that sin. I did not learn this lesson until I light understood the Greek grammar of these words. If anything makes this ministry different than others, it is because I am obsessed with the Greek grammar of the word of God, the very language that God chose to convey this most precious message to mankind, the gospel of Jesus Christ, wherein God’s only begotten son, the incarnate deity and God who came down to pay for our sins. Generically, the sixth thing that Jesus said from the cross, generically is interpreted, “it is finished.” Yet specifically the Greek means “paid in full,” or recompense and full. Many would ask the difference in these two understandings. I’ve heard many people that are not believers say that Jesus was a good teacher, and with this mindset could say that when he said it is finished he was referring to his teaching. Or perhaps he was referring to giving up his life. Jesus teaching is important but it is not the primary reason for his incarnation, because without his death his teaching would do us no good, we might become more moral people but we would still go to hell. The Gospel is not the teachings of Jesus. There is nothing that I can add to my own salvation he did 100% of it, it is simply my pleasure to accept it by believing it, and thus live a life of faith and trust in him, never taking for granted the power of sin, understanding how much he paid to purchase me because of it. This is what knowing the Greek grammar means to an individual who wishes to teach God’s word, not generically regurgitating what a root dictionary states. As has been stated in his defense, James Strong never contributed original research. The term original research has to do with defining words terms and insights as compared to restating passages as is done in a concordance. A concordance is a guide that list individual words to be found in the Bible, by its very nature it is not an original research work, utilizing rules of literature or science in defining or presenting hypothesis or conclusions. 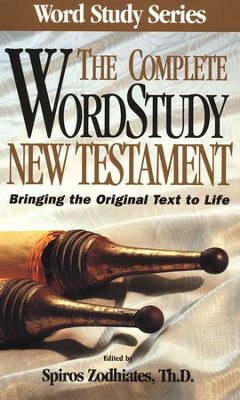 What the writers did was categorize English words in the English translation of the Old and New Testaments alphabetically as a guide to their location within these volumes – their purpose was never to define words, or prescribed two or teach doctrine or theology, a concordance is a book of lists. One of the best layman Greek Word Studies, meaning that the author defines the words without explaining the delineation of the verb, such as: the tense, mood, voice, gender, and number; or the case of the noun or other grammatical nuances; is found in The Complete Word Study New Testament along with the other dictionaries and parallel Bibles within this series. However, as good as utilizing Greek word studies can be, this still only displays a partial understanding of any specific word without going into the details of the grammar itself. The excellent Greek translation work done by Spiros Zodhiates TH. D; is by far a great tool for the biblical layman. Spiros earned his doctorate degree (achieved) in University after many years of study in the Greek language. He is fluent in writing and speaking in Classical and Koiné Greek, and also has spoken Greek all his life as a native of Greece. He translates words based upon the specific Scripture, where the differences of how a word is translated is based upon the grammar of the verbs in that particular usage in the context wherein each usage of the word can be completely diverse from another. Strong’s was never meant to be an exhaustive Greek Dictionary, it was designed to give a general reference to the meaning of words utilized within his concordance, whose main purpose is to locate words in the Bible using an identification system which is common in most Greek translation work. Strong’s Concordance Exhaustive Concordance of the Bible, generally known as Strong’s Concordance, is a concordance, constructed under the direction of Dr. James Strong (1822–1894), of the King James Version (KJV). Dr. Strong first published his Concordance in 1890, while Professor of exegetical theology at Drew Theological Seminary. It is an exhaustive cross-reference of every word in the KJV back to the word in the original text. Unlike other Biblical reference books, the purpose of Strong’s Concordance is not to provide content or commentary about the Bible, but to provide an index to the Bible. This allows the reader to find words where they appear in the Bible. This index allows a student of the Bible to re-find a phrase or passage previously studied. It also lets the reader directly compare how the same word may be used elsewhere in the Bible. In this way Strong provides an independent check against translations, and offers an opportunity for greater, and more technically accurate understanding of text. language words listed in the back of the concordance. These have become known as the “Strong’s numbers”. The main concordance lists each word that appears in the KJV Bible in alphabetical order with each verse in which it appears listed in order of its appearance in the Bible, with a snippet of the surrounding text (including the word in italics). Appearing to the right of scripture reference is the Strong’s number. This allows the user of the concordance to look up the meaning of the original language word in the associated dictionary in the back, thereby showing how the original language word was translated into the English word in the KJV Bible. New editions of Strong’s Exhaustive Concordance of the Bible remain in print as of 2012. Additionally, other authors have used Strong’s numbers in concordances of other Bible translations, such as the New International Version and American Standard Version. These are often also referred to as Strong’s numbers. New editions of Strong’s may exclude the comparative section (1611 KJV to 1614) and the asterisks that denote differential definitions of the same Hebrew or Greek words; due perhaps to denominational considerations, definitions may also be altered. Although the Greek words in Strong’s Concordance are numbered 1–5624, the numbers 2717 and 3203–3302 are unassigned due to “changes in the enumeration while in progress”. Not every distinct word is assigned a number, but only the root words. For example, αγαπησεις is assigned the same number as αγαπατε – both are listed as Greek word #25 in Strong’s αγαπαω. Strong’s Concordance is not a translation of the Bible, nor is it intended as a translation tool. The use of Strong’s numbers is not a substitute for professional translation of the Bible from Hebrew and Greek into English by those with formal training in ancient languages and in the literature of the cultures in which the Bible was written. Since Strong’s Concordance identifies the original words in Hebrew and Greek, those without adequate training sometimes misinterpret Strong’s numbers to change the Bible from its accurate meaning simply by taking the words out of cultural context. The use of Strong’s numbers does not consider figures of speech, metaphors, idioms, euphemisms, common phrases, cultural references, references to historical events, or alternate meanings used by original writers to express their thoughts in their own language at the time. As such, professionals and amateurs alike must consult a number of contextual tools to reconstruct these cultural backgrounds. Many scholarly Greek and Hebrew lexicons (e.g., the Brown, Driver, Briggs Hebrew lexicon, Thayer’s Greek Lexicon, and Vine’s Bible Dictionary) also use Strong’s numbers for cross-referencing, encouraging hermeneutical approaches to study. The link below is where you can find my article on free biblical software programs in delineating the a verbs and parsing the Greeks of the New Testament. “In linguistics, cognates are words that have a common etymological origin. In etymology, the cognate category excludes doublets and loan words. The word cognate derives from the Latin noun cognatus, which means “blood relative”. Cognates do not need to have the same meaning, which may have changed as the languages developed separately. For example, consider English starve and Dutch sterven or Germansterben (“to die”); these three words all derive from the same Proto-Germanic root, *sterbaną (“die”). English dish and German Tisch (“table”), with their flat surfaces, both come from Latindiscus, but it would be a mistake to identify their later meanings as the same. Discus is from Greek δίσκος (from the verb δικεῖν “to throw”). A later and separate English reflex of discus, probably through medieval Latin desca, is desk (see OED s.v. desk). Cognates also do not need to have obviously similar forms, e.g. English father, French père, and Armenian հայր (hayr) all descend directly from Proto-Indo-European *ph₂tḗr. Crystal, David, ed. (2011). “cognate”. A Dictionary of Linguistics and Phonetics (6th ed.). Blackwell Publishing. p. 104. ISBN 978-1-4443-5675-5. OCLC 899159900. Retrieved 16 March 2016. Jump up^”cognate”, The American Heritage Dictionary of the English Language, 4th ed. : “Latin cognātus: co-, co- + gnātus, born, past participle of nāscī, to be born.” Other definitions of the English word include “[r]elated by blood; having a common ancestor” and “[r]elated or analogous in nature, character, or function”.Crystal, David, ed. (2011). “cognate”. A Dictionary of Linguistics and Phonetics (6th ed.). Blackwell Publishing. p. 104. ISBN 978-1-4443-5675-5. OCLC 899159900. Retrieved 16 March 2016. Jump up^”cognate”, The American Heritage Dictionary of the English Language, 4th ed. : “Latin cognātus: co-, co- + gnātus, born, past participle of nāscī, to be born.” Other definitions of the English word include “[r]elated by blood; having a common ancestor” and “[r]elated or analogous in nature, character, or function“. I only use the Textus Receptus (Theopedia.com) for Greek word study meanings, there are too many thousands of deviations in the newer (Alexandrian type text) translations which do harm to the original meaning. The Textus Receptus, utilized for the King James Translation has known English translation errors that are understood, corrected, and do no fundamental damage to any doctrine, unlike the newer translations. The New King James is not based upon the Textus Receptus (Wikipedia.com). Read the introduction to the New King James Bible, it is written in the spirit of the King James Bible (Textus Receptus), but it is based upon Alexandrian codices, which many translators, including myself feel are corrupted when it is compared with the Textus Receptus (Chick.com), [See Footnote #4 below]. Textual Criticism is a complicated subject, where there are individuals which abuse forms of translation styles and formats, commonly referred to as Higher Criticism (newworldencyclopedia.org), which was created 200 years ago. I am a follower of the teachers of the last few hundred years regarding Lower Criticism, which has been the standard of literature research and biblical criticism for the last 2000 years, beginning in the early writings of the second century and utilized in Antioch as the first Christian center of education regarding the gospel, under the leading of Lucian of Antioch (Britannica.com) [though vilified and belittled by the followers of Higher Criticism], who utilized those texts which were later made up the Textus Receptus. For over 1300 years these documents had been used until they were codified in the authorized text. Higher Criticism teaches that many of the books of the Bible were NOT written by the stated authors, and are not credible as an errant, such as the Deutero-Isaiah theory, or the Documentary Hypothesis of the Pentateuch, also known as the JEDP Theory. Almost all of the newer critics that follow Higher Criticism (GotQuestions.com) do not believe in the complete inerrancy of the Bible, nor many believe in the inspiration of the holy writ as well. On the other side of the issue are those who referred to themselves as King James only purist who even go so far as to state that the English translation of the Textus Receptus, the King James is the only inspired word of God. They go so far as to even indicate that the Textus Receptus and other original Greek language New Testaments are corrupted, while the translated into English version of the King James is pure and without any translational errors, which is quite ridiculous in itself. There are many of us that believe that the Textus Receptus may be the best Koiné Greek copies that we have, yet also value the other Byzantine texts as well, referred to as the Majority Text. “Saint Lucian of Antioch, (born c. 240, Samosata, Commagene, Syria [now Samsat, Turkey]—died January 7, 312, Nicomedia, Bithynia, Asia Minor [now İzmit, Turkey]) Christian theologian-martyr who originated a theological tradition at Antioch that was noted for biblical linguistic scholarship and for a rationalist approach to Christian doctrine. T. Böhm’s comments are disputed by many, and at variance with fourth and fifth century church writers, wherein Lucian’s work on the Septuagint and Koiné Greek New Testament is not in question, but considered a fact due to the preponderance of witnesses, wherein questioning the criteria of Lucian’s work in both of these works is ridiculous. When a large preponderance of credible witnesses attributes a written work to Lucian of Antioch, one should come to the conclusion that one speculation does not outweigh the preponderance of evidence given by these individuals. Simply stating that IF there is no proof of how someone did something, because you do not understand how they did it, is not evidence against the claim that it was done by that person. And secondly, simply because Lucian may have constructed or presented words, expressions, sentences, or written works in the same style as a previous writer of great fame, perhaps even quoting them or coming to the same conclusions concerning a translation, does not disqualify what Lucian translated. The point is, what is the most accurate translation, rather Josephus translated text correctly, or Clement, or any other writings; what should be of concern is the accuracy of that translation, not if others have come to the same conclusion prior to the work in question. If you note a bias in my tone concerning T. Böhm’s work, it is because after having read much of what he has written, I find his own prejudice to be overwhelming, and his lack of investigative analysis to be immense, to the extent he holds no credibility with myself, and many others, even if he is highly acclaimed among those that adhere to Higher Criticism. Speaking for myself, as a born-again Protestant believer who holds to a literal translation of the Bible, I maintain conflicting views concerning many major theological doctrines with Thomas Böhm, a German Roman Catholic theologian lacking agreement with many of his German Roman Catholic views. First let me share an online resource which you can use to break down the grammar of the Textus Receptus yourself. When you see a second set Strong’s numbers in brackets over a word, it is using a (“Strong’s TVM,” meaning Tense, Voice, and Mood), grammatical number to indicate the breakdown of the word. This numbering system is listed with type Strong’s numbers, but was created a few years ago to help students of English break down Geek Bible words – it is a good layman aid.